Chicanes or serpentines are short, horizontal displacements in the roadway that create a curvilinear alignment, which encourages slower speeds. Driver’s view of a chicane (City of Winston-Salem, North Carolina 2003). Chicanes are short, horizontal displacements in the roadway that create a curvilinear alignment, which encourages slower speeds (Andrle et al. 2001). 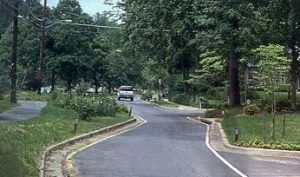 Chicanes are also called serpentines, as the physical constrictions at curbside create a 45 degree bend in a straight road, which forces drivers to negotiate the narrowed street in a snakelike fashion (Ewing 1999). Traditional chicanes often require a change in the roadway alignment given they physically change the roadway. Chicanes were evaluated on an arterial in Toronto, Canada. The roadway was 28-feet-wide and chicanes were created using modular traffic-calming islands. The road was narrowed to 21 feet with chicanes. A reduction in the 85th percentile speed from 50 km/h to 45 km/h occurred (Macbeth 1998). No crash modification factors (CMFs) were found relating to chicanes. Chicanes, when properly designed, may be appropriate for rural main streets. Special considerations must be given to geometrics if there is a high percentage truck traffic, because curb overtopping could be a problem. Consideration must be given to alignment so that heavy trucks and farm equipment are able to negotiate the roadway safely. Cost is highly dependent on the roadway setting. Temporary or seasonal chicanes are other options. Andrle, Stephen J., Keith K. Knapp, Tom McDonald, and Duane E. Smith. Iowa Traffic Control Devices and Pavement Markings: A Manual for Cities and Counties. Center for Transportation Research and Education, Ames, IA, 2001.